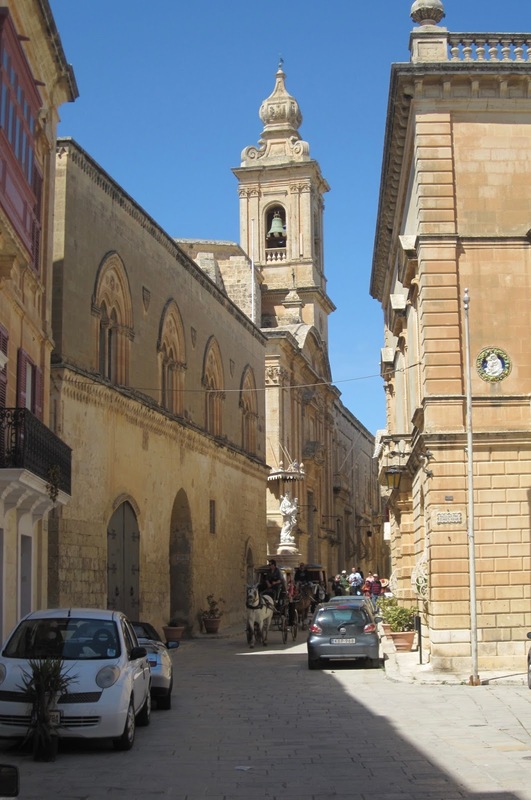 The ground floor of Palazzo Santa Sofia in the former Maltese capital of Mdina is thought to be the oldest remnant of medieval architecture in the city. The date 1233 is inscribed on the facade, a period when Malta was part of of the kingdom of Sicily and the Holy Roman Empire. The first floor with its gothic-style windows was only added some time after 1938. The building is similar in appearance to the nearby Palazzo Falson, also originating in the 13th century but rebuilt in 1495 and completed in the mid-17th century. The church at the back is dedicated to the annunciation of the virgin and was built in 1660-75 by French military engineer Medico Blondel des Croisettes. Saint John's Co-Cathedral was built in 1573-78 to a design by the architect Girolamo Cassar, as the communal church for the Knights Hospitaller in the new Maltese capital of Valletta. The presence of the knights was established 40 years earlier when Charles V of Spain, who was also King of Sicily, granted the island in 1530. The knights had lost their previous headquarters on Rhodes in 1522 due to an Ottoman invasion and were challenged by the Turks again on Malta in 1565. This time, however, the knights held off the attackers and the siege was abandoned. The decision to build a new capital city was taken immediately after the victory as an effort to eliminate a remaining weak point in the defences of the Grand Harbour, where the knights were based. The new city was named Humilissima Civets Valletta, in honour of Grand Master Jean Parisot de Valette. The oratory and sacristy of the church were added in 1598-1604 and the interior was given a baroque redesign in the 1660s. 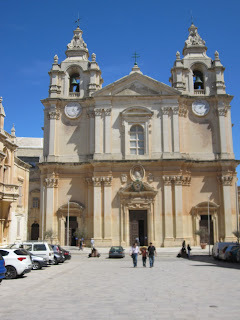 Annexes were also built in 1748 and it became co-cathedral of Malta by papal decree in 1816. 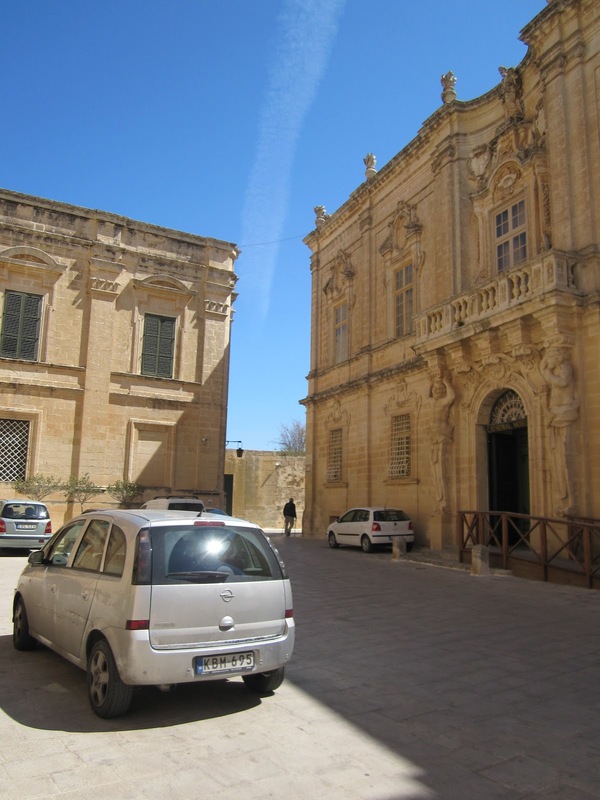 The Grand Master's Palace was also originally designed by Cassar and built in 1571-80, incorporating previous houses built in the 1560s including a palace completed in 1569 for Eustachio del Monte. The palace was expanded and embellished by successive grand masters, a second gateway and timber balconies were added to the main facade in the mid-18th century. The knights were expelled from Malta after the French invasion in 1798 and the palace eventually became the residence of the British governors of Malta. Self-government was granted in 1921 and the palace became the house of parliament, continuing in this function after independence in 1964. Parliament moved to a new building in 2015. The Knights Hospitaller moved the capital from Mdina to Birgu when they first arrived on Malta in 1530, in order to establish a strategic defensive base on the coast. 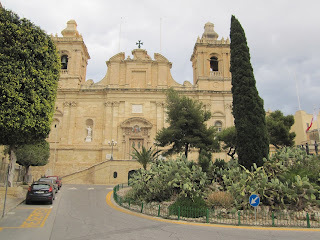 The town was quickly fortified and the medieval church of St. Lawrence was adopted as the knights' first communal church on Malta, which it remained until 1570s when the new church in Valletta was completed. St. Lawrence was rebuilt to a design by architect Lorenzo Gafa in 1681-96 and was consecrated in 1723. 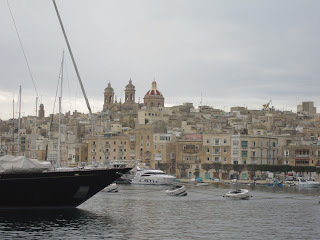 Birgu is also known as Vittoriosa in honour of the the great siege of Malta in 1565. St Paul's cathedral in Mdina was built in 1696-1705 to a design by architect Lorenzo Gafa after the previous cathedral was damaged by earthquake in 1693. 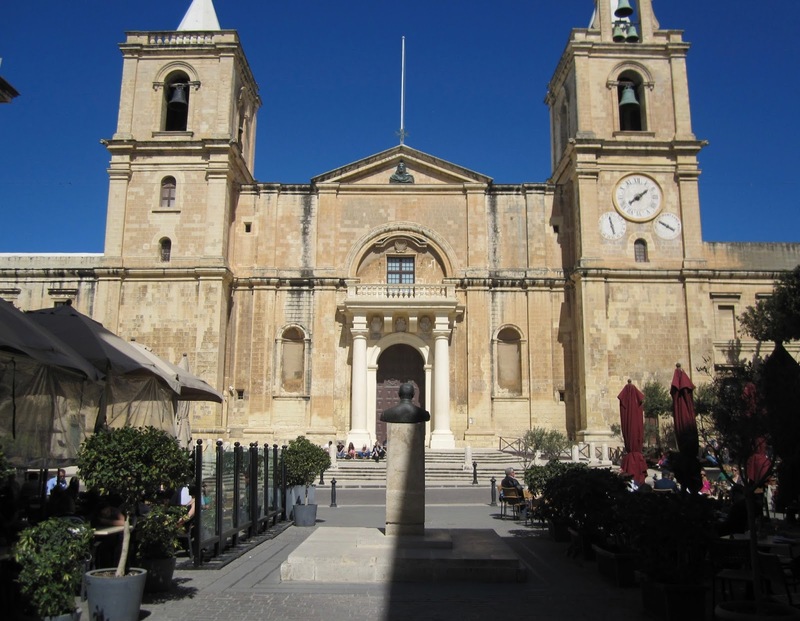 According to tradition, the site was the home of the Roman governor of the ancient city Melite, who became the first bishop of Malta after Paul the apostle was shipwrecked on the island and converted the population to Christianity. The previous cathedral was built in the 12th and 13th centuries, as the original had fallen into disrepair during the period of Arab rule, from the fall of Sicily in 827 to the Norman conquest in 1091. Lorenzo Gafa had already replaced the medieval choir after 1679 and this earlier work was incorporated into the new building. 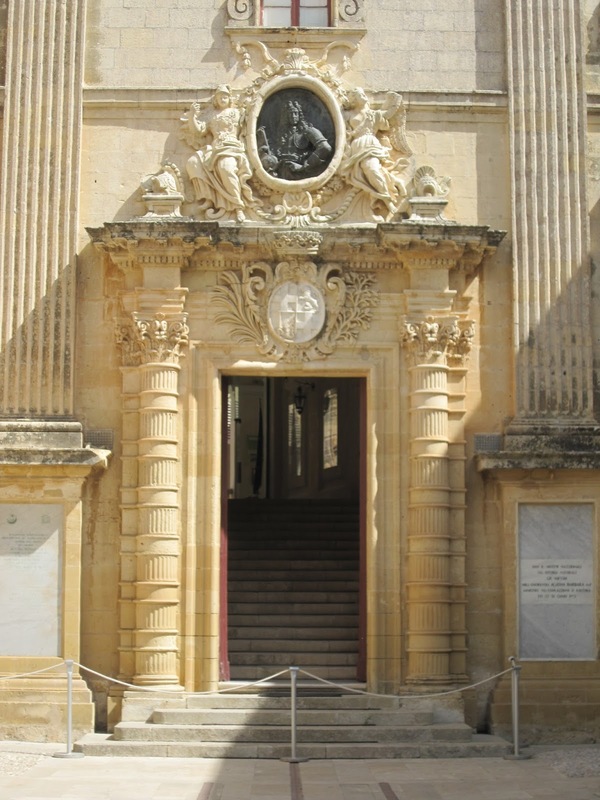 Palazzo Vilhena, also known as the Magisterial Palace, was built in Mdina in 1726-28 to a design by architect Charles Francois de Mondion. It was built as a summer palace for the Grand Master Antonio Manoel de Vilhena on the former site of a Byzantine fort. The fort had developed into a castle in the middle ages and been partly demolished in the 1530s before being converted to an administrative building by the Knights Templar. The building was used as a hospital at several periods in the 19th and 20th centuries and has been a museum since 1973. The Auberge de Castille was originally built in the 1570s to house the Knights Templar of Castile, Leon and Portugal, but was redesigned or entirely rebuilt in the 1741-44 by architect Andrea Belli. The church on the left is dedicated to St Catherine of Italy and stands adjacent to the Auberge d'Italie. It was originally built in 1576 though the current facade is from 1713 and alterations were also made in the 17th century. The litte Doric temple in the Lower Barakka Gardens in Valletta is one of the first monuments to British rule on Malta. It was erected in 1810 by public subscription in honour of Vice-admiral Alexander Ball, who led the blockade against French-occupied Malta in 1798-1800 before becoming the first British governor of Malta in 1801. St Paul's pro-cathedral was built in 1839-44 to a design by architect William Scamp on the former site of the German Knights Hospitaller. The project was initiated after a visit by Queen Dowager Adelaide when she discovered that there was no Anglican place of worship on Malta. The tower, which is one of Valletta's most recognisable landmarks, is similar to St Martin-in-the-Fields in London. It is one of three cathedrals of the diocese of Gibraltar in Europe, which covers all of Europe and Morocco. The other two cathedrals are in Gibraltar and Brussels. 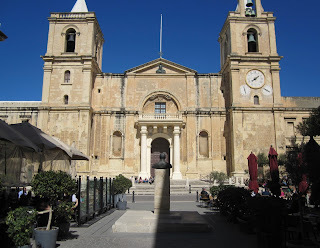 St Publius Parish church was originally built in 1733-68 and the facade had been rebuilt 1771 but the current front with temple portico and bell towers is from 1889-92, by architect Nicholas Zammit. It was partly destroyed during bombing in 1942 and was restored in the 1950s. The church is located in Floriana, a suburb outside the city gate of Valletta, originally established in 1724 as Borgo Vilhena. It was later renamed in honour of the military engineer Pietro Paolo Floriani, who built Valletta's outer defences in the 17th century. Triq it-Teatru l- Antik, Old Theatre Street: Most of the buildings on Malta are built with a yellowish limestone. However, the city is full of ornate, painted wooden bay windows and balconies. Triq Żekka, Old Mint Street, takes it name from the Order's mint, located in this street. Also on this street, is found the basilica of Our Lady of Mount Carmel. A chapel was constructed in 1570, and was replaced with a larger structure designed by Girolamo Cassar in 1586. In the 17th century, the church was transferred to the Order of Our Lady of Mount Carmel. The facade was redesigned in 1852 by Giuseppe Bonavia, and in 1895 the church was elevated to the status of Minor Basilica. However, the basilica was heavily damaged by bombing during World War II, and the present structure was built as recent as 1958-1981, according to a new design by Guzé D'Amato. The reinforced concrete dome is 62 metres high and one of the most prominent features of the Valletta skyline. Before Valletta, the capital of Malta was Mdina (known previously as Città Vecchia or Città Notabile). It is located at one of the island's highest points and furthest away from the sea. The city was inhabited by Phoenicians, who called the city Maleth, around 700 BC and was possibly fortified at this early date. It was since taken over by Romans, Arabs and Normans. The city grid is mostly medieval, but several buildings are baroque, due in large part to an earthquake in 1693. The building on the right is the Cathedral Museum, a baroque 18th century palace originally used as a seminary. Senglea is one of the Three Cities in the Grand Harbour Area, created by the Knight Hospitaller as a massive line of fortification on the eastern side of the Harbour. Fort St Michael was built in 1552-53 and played a major part in the Ottoman siege in 1556. By that time, a walled town already existed and was given the name Senglea in honour of Grand Master Claude De La Sengle. After the siege, the city was also referred to as Civitas Invicta (Unconquered City). Most of the city was destroyed during World War II and has relatively few buildings of historic interest. The new Basilica was completed in 1957, according to a design by Vincenzo Bonello. The original church on this site was completed in 1580. The Parliament Building was built in 2011-15 to a design by the architect Renzo Piano, being part of a larger project including a new city gate and conversion of the ruins of the royal opera house into an open-air theatre. Both the earlier gate from 1853 and opera house from 1866 was destroyed during an aerial bombardment in 1942. A new gate had been built in 1964-65, becoming the fourth city gate of Valletta, but was demolished in 2011. Plans to rebuild the opera house, originally by architect Edward Barry, were eventually abandoned. The opera house was built in 1866 by architect Edward Barry.